We tagged along to the Academy riders training day that took place on the 7th of Feb on an energy sapping route on the Mendip hills as the riders look to develop ahead of some major events in the coming months.Winter was truly upon the academy’s training ride this weekend as the riders travelled through hail & sleet to meet at the Chew valley visitor centre for a lumpy ride over the Mendip hills. 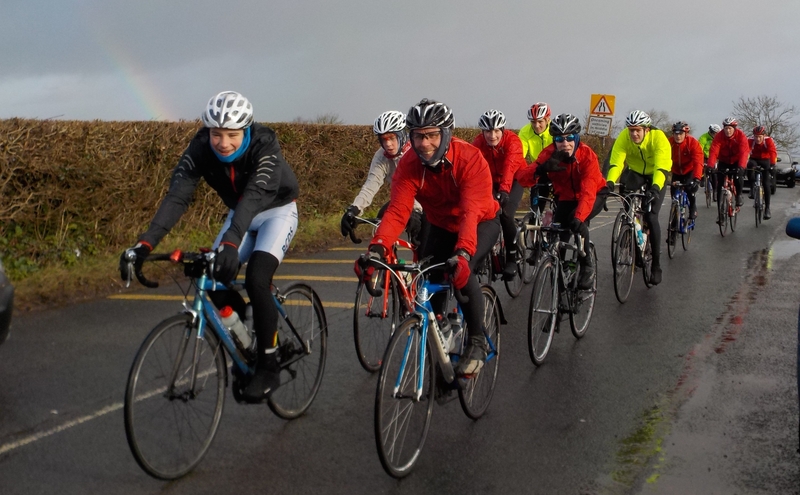 Academy manager Dan Coast would lead the ride from the warmth of a car whilst the riders were supported by a number of parents who rode with the riders helping to keep them on route during the days 3 hour long ride designed to allow the riders to get to know each other and for Dan to see how the riders are progressing after a month of prescribed training. The route would take in the main obstacles of Stage 2’s route of the Screentek International Junior Tour of the Mendips and with several members not eligible until the 2017 edition it was a good opportunity to get some early prep. The climbs would also present an opportunity to test the riders and see how they are responding to similar prescribed training with hills. Rolling out from Chew Valley Lake the riders were greeted initially with rain which soon stopped but with already saturated roads from an earlier downpour were still getting wet enough. The route would see a rolling 8 miles to the bottom of Burrington Coombe before taking in long climb through the gorge, during this time the riders would take on a number of short intervals going flat out then trying to recover within a minute before attacking again, this would replicate the effort of attacking or chasing in a crit. with the hill reducing the amount of recovery offered. With this effort complete the riders took a short cut off the Mendips down Harptree hill and splitting with our younger members heading back to Chew Valley to complete their 90min ride whilst the Youth A riders still had more work to be done & retraced the route back to Blagdon. Once again they repeated the efforts up the steep "bergesque” hill which offers no real recovery. Two down & one to go, the riders were now on route to the final climb up Harptree hill and the final set of efforts, The Harptree climb is similar to Blagdon but not quite as steep though the gradient remains the same throughout. It is easier to get into a rhythm but by this point the riders had amassed quite a few meters of climbing and the efforts were starting to show. With the final climb in the bag the riders returned the short distance back to Chew Valley, a quick debrief before heading home to refuel and no doubt warm up.It was fantastic to see and as they got through todays ride they should have no trouble overcoming any other obstacles along the way during the season and have a handy advantage for the 2017 Junior Tour. Good luck for the season ahead.